Beyond the huge array of features in the core system, the FOOD-TRAK System offers specialized flexibility through its complete line of fully-integrated modules. Each module is designed to extend the system’s capability to meet the needs of specific types of foodservice operations, as well as integration with hundreds of accounting, vendor, catering and POS systems. We are constantly working to improve and expand, paying close attention to the requests of our clients and add new features frequently. We also offer software customization services to further enhance the system for virtually any specific client requirement. FOOD-TRAK is a true browser-based solution, using the latest Microsoft .Net technologies for the application and Microsoft SQL for the database engine. Users need only Internet Explorer on their local computer to access the system, which can be located on the company’s systems, or on our hosted datacenter systems. The hosted software approach provides clients with the flexibility of paying a quarterly or annual fee to use the software from anywhere in the world over the internet without the need to purchase and manage hardware or licenses. Specifically designed to address the needs of food and beverage procurement for clients with larger, more complex operations. It includes a variety of features that optimize and streamline the procurement process from sourcing to distribution. This module is ideal for businesses with centralized purchasing or warehousing who need increased flexibility and capability. Immediately and consistently reduce your food costs without incurring any additional labor with the Vendor Bidding Module. Let the vendors do all the work while you reap the benefits. It is easy to use and can significantly lower your food costs, improve your cash flow and get you the best possible prices on products. Designed to allow clients to do away with printing, writing on and entering data from paper forms. Instead, clients can record data at the point of activity, thus improving efficiency so that data is available for reports almost immediately. 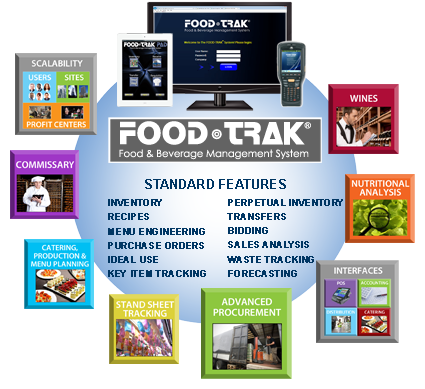 This unique and powerful tool allows FOOD-TRAK users to reduce labor costs associated with inventory, ordering and transfers by as much as 75%!I Its thoughtful design helps eliminate inaccuracies by allowing clear identification of items, convenient use of multiple units of measure and extreme flexibility to handle almost any data collection situation. Using the FMP can single-handedly save enough time and money to pay for the entire food and beverage management system many times over. Simplifies the task of identifying and publicizing the nutritional value of food or menu items by providing nutritional data on complete meals or individual food items (served or sold) according to the United States Department of Agriculture (USDA) standards and Recommended Daily Allowance (RDA) data. Specifically designed for foodservice operations, such as K-12 schools, universities, supermarkets, healthcare institutions and restaurants, the FOOD-TRAK Nutrition module makes the process of creating and documenting the nutritional content of your products quick and easy. Expands the core functionality of the FOOD-TRAK System to handle production planning and tracking, cyclical menus, catering integration and fabrication tracking. This module is ideally suited for clients with high volumes who rely on production planning to maximize efficiency and clients with significant catering or fabrication work. Specifically designed for clients who sell or transfer goods to customers or company-owned stores using mark-ups or invoices. The module allows you to optimize business performance by controlling and managing the flow of orders coming from commissary customers, the processing of those orders and the shipment of goods back to the customers using this feature. The Broadcast Module allows two-way flow of data from site to site, and has very sophisticated approaches to selecting items and fields within those items for broadcast. Clients with centralized systems can update multiple sites through the Broadcast Module simultaneously and clients with distributed systems can easily transmit the data in pre-formatted files which are automatically recognized by local FOOD-TRAK® systems and imported upon arrival. Saves time and takes the guesswork out of controlling and managing large wine inventories, allowing clients to maintain maximum control and generate the highest possible wine profits. This module is ideal for clubs, hotels, restaurants and casinos that stock and sell significant varieties of bottled wine. A stand-alone system intended for corporate operations whose multi-outlet FOOD-TRAK data needs to be consolidated at the corporate level and whose reports may need to be shared at various levels of the corporate structure. Individual locations export data files that are then imported and stored in a central corporate database. Once inside the corporate database those various sets of data are used to create consolidated reports which can be distributed for viewing in a variety of ways. SCI has always focused on integrating the FOOD-TRAK® System with all related systems. Hundreds of customized interfaces have been developed to ensure no duplication of data entry is required. New interfaces are also continually released. Interface categories include Point of Sale interfaces, Catering System interfaces, Vendor System interfaces, and Accounts Payable System interfaces.